It's a local spin on a national movement, and here in Kent County, Encore encourages retirees of all ages to stay engaged in their communities by continuing to live a purpose-driven life. Find out how some wise residents are keeping our community vibrant, sharing their stories, and growing new careers one hop at a time. When people think about retirement, many think about activities such as traveling, relaxing, or spending more time with family. But for the last year, the Grand Rapids Community Foundation (GRCF) has been looking for Grand Rapidians with a different type of retirement story, people who found a second way to contribute to society following their retirement. They appropriately refer to these experienced adults as "Encores." Kate Schmid of GRCF explains that Encore is not a program the foundation facilitates, but more of a movement encouraging retirees to consider how they can continue to contribute to society after their first career. "Encore" is a term to describe a series of investments that GRCF made over the last decade that work to engage experienced adults with community issues, and with organizations that they’re passionate about and could make a contribution towards. Schmid explains, "We think of ourselves as the thought leader. We’re trying to start a conversation about what we’re doing with this untapped resource. Paid or unpaid, it's about service to a community. What GRCF is doing is encouraging people to think about their Encore. To see others in their encore, and say 'Yeah, that does resonate with me.'" In 2004, GRCF began noticing the changing demographics, and noted the drastic change Kent County will see over the next 30 or 40 years with a large part of the population coming up on retirement. When they asked area agencies about a plan for the future, they noticed everyone was only looking at the deficit side. GRCF decided to focus on it as an asset. "Here is this incredible generation that’s never [before] been as well educated, financially stable, healthy, engaged, and also have a civic approach to what they’ve been doing through their professional lives," Schmid says. "Our goal is to raise the visibility and the conversation [about Encore], and recognizing that we’re creating a demand that can’t be met right now. We hope that there’s also support from the community to create those opportunities." GRCF then contacted Mark Freedman, who founded the national Encore movement. He had just started Encore two years earlier (then called Civic Ventures), so they connected and brainstormed. GRCF started a grassroots version of Encore in Grand Rapids, and Civic Ventures went on to become Encore.org (www.encore.org). One technique GRCF has successfully used to spread the word is storytelling. Tom Rademacher and Nancy O’Brien were asked by GRCF to seek out Encores and share their stories on the GRCF website. "We’ve been careful not to label 50+, you know, the whole baby boomer thing. Because people in their 40s are feeling this way too, and looking for a purpose driven life. They want to see that what they do makes a difference to the community in some way," says O’Brien. "A lot of people that are having traditional retirement are wondering what to do next, and looking for a connection. We’re hoping that through our storytelling that they can see the possibilities." Mary and Morrie Dieleman are one such example of a successful Encore story. After 20 years as an occupational therapist, followed by 18 years as a counselor in Kentwood Public Schools, Mary Dieleman had just retired. While on an errand with her mother, she drove past a single acre of hops and had to ask her mother what it was. 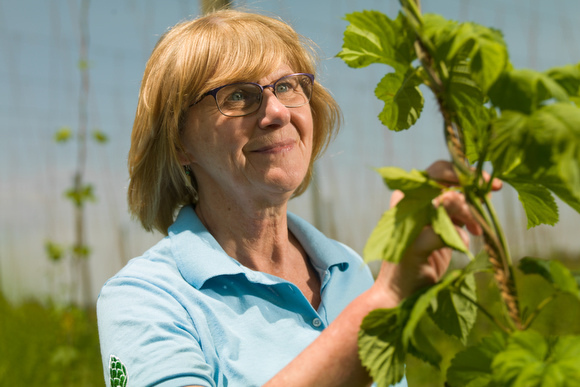 It wasn’t long, though, before she and her husband Morrie, also a retired social worker, decided to start a three-acre certified organic hops farm of their own. This fall they plan on supplying local breweries with hops grown on their farm, Pure Mitten Hops. Their farm is also solar powered, helping them to become Michigan Agriculture Environmental Assurance Program (MAEAP) certified. Ms. Dieleman is grateful for her experience as a social worker, though. "Useful skills gained from my careers were being an organized person, and thinking things out logically. Occupational therapists simplify jobs and job steps, making work more attainable, " she says. "Social skills were also useful." Mr. and Ms. Dieleman currently work full time on the farm, but do take time to golf and babysit their grandson. They hope to expand over the next two years, eventually handing the farm over to their son, his wife, and her brother, giving the Dielemans more time for another of their passions, traveling. Their story will also soon be featured on the national Encore website. Rademacher and O'Brien search high and low in Grand Rapids for stories like the Dielemans'. "The more we tell our stories, the more we get to know each other," says Rademacher. "These are 300 words about people with value. They help to inspire the rest of us to recognize there is more after retirement." O'Brien explains that the only challenge she finds is that Grand Rapidians are hesitant to tell their stories. "People are very humble in Grand Rapids," she says. "It’s hard to get them to tell their story. We do keep finding people though. The challenge always is to get the story out and in the media." O'Brien says that GRCF encourages retirees to use outside resources to find their own Encore experience, such as AARP's Experience Corps, Calvin College's Calvin Academy for Lifelong Learning (CALL), and the Volunteer Center. Both Rademacher and O'Brien praise GRCF for starting and supporting Encore. "All credit goes to GRCF for stepping forward and starting the conversation," says Rademacher. "Encore makes us realize that even in subtle small ways, we all can do something that matters and contribute to the greater good. And in the process make other people belong, one handshake at a time. Great feelings emanate from one person extending a hand to another." Lorena Slager Wenzel is a freelance writer and the owner of The Sparrows Coffee Tea & Newsstand. She also co-founded and currently sits on the board for the Creative Youth Center, a non profit creative writing center for at risk kids in Grand Rapids. More of her work can be read at www.with-both-feet.com.